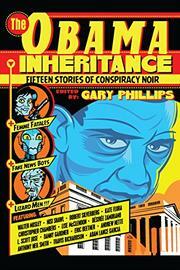 In this collection of stories edited by Phillips (Orange County Noir, 2010, etc.) and inspired by the racist backlash to Barack Obama’s presidency, 15 writers grapple with—and parody—white America’s fear of the 44th president. The collection is a mashup of genre fiction, ranging from spy thrillers to noir mysteries to science fiction. Some of the stories take place in dystopian futures suffering the effects of racial backlash. Danny Gardner’s “Brother’s Keeper” flashes forward to a time when America has endured rule by several Trumps. The country’s environmental policies have forced millions into space, children are forced to attend Trump Academy, and undocumented immigrants are punished with death. The story follows a black teen as he attempts to verify an urban legend: that there was once a black president from a forgotten land known as Chicago. Walter Mosley’s “A Different Frame of Reference” takes place in the contemporary American South, exploring a secret society of white supremacists hellbent on undermining President Obama’s administration by planting news stories and enforcing racial fear in their communities. The story takes place in the claustrophobic mind of a gleefully racist narrator only for the reader’s assumptions to be turned on their heads. In perhaps the most delightful entry, Kate Flora’s “Michelle in Hot Water” reimagines the former first lady as a secret agent working to take down shadowy Russian interests. These stories are engaging, but they sometimes sink into didacticism, using genre fiction as a way to make points about white America’s fear of black political power. The lessons are welcome, but they are often too on-the-nose to be effective. The stories are at their best when they forego lecturing and rely on narrative and satire to imagine the consequences of white supremacist politics on American society. A surprising, though sometimes frustrating, collection that uses genre fiction to confront the impact of Obama’s presidency on the white American psyche.